Many women are anxious when the time comes to visit a hair salon. We don’t want to lose too much of our beautiful long hair and feel unsure if a new haircut would suit us. And of course, we can’t always afford it, because a visit at a professional salon might be quite expensive. Unfortunately, to have long and healthy hair, we have to trim it regularly, especially the ends which are most prone to damage and splitting. The basic hair care, then, involves also cutting which enhances regeneration and easier styling. If for some reason we can’t visit beauty salon regularly, we can easily cut our hair at home. In the case of long and layered hair, this might be a bit more challenging, but still doable. All you need to succeed is a few clever tricks. Whether you should dry cut or wet cut is a matter of personal opinion. You might try both methods and decide for yourself which one suits you best. Wet hair is more elastic and thinner, so after drying the haircut might turn out different than we expected. 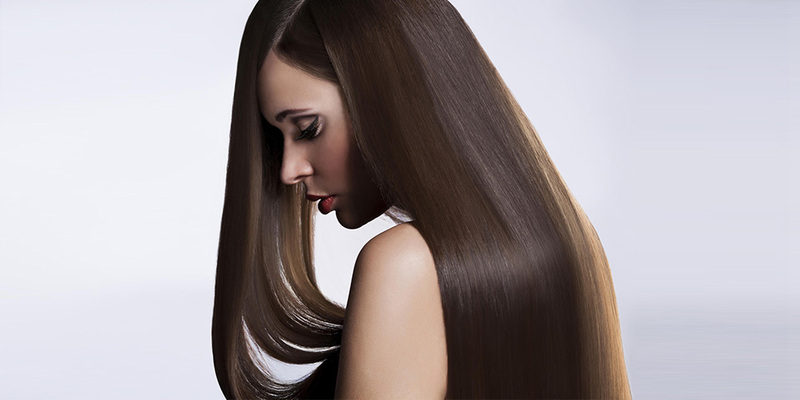 Dry hair, in turn, is often frizzy and tends to escape from under the scissors. Before you start cutting, you should make sure that your hair is thoroughly combed (or brushed) and that there are no tangles. Otherwise you risk an uneven cut! It is also essential that you part your hair exactly the way you do it everyday to tailor the cut to your usual look. 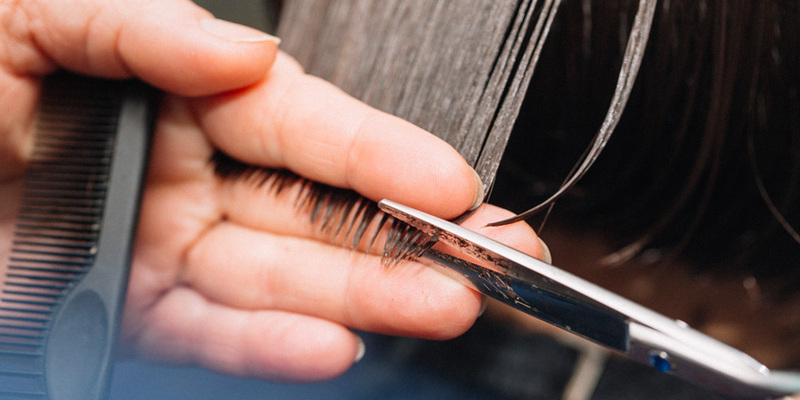 If you wear bangs, clip them up to separate them from the rest of your hair. After you have parted your hair, move both parts forward across your shoulders and tie with an elastic right below your chin. The elastic is needed here to make sure that the cut is even and symmetrical. Now double check if your hair is well-combed and smooth. If unsure, comb it one more time. Hold your hair firmly at the ends and cut evenly. If this is your first attempt at trimming, do not cut too much – make sure that you are satisfied with the effects. Last but not least, trim your bangs. If your bangs are asymmetrical start with the upper part and go downwards. Try this method for straight and blunt cut. 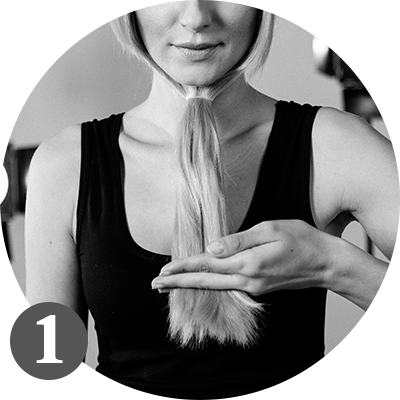 Part your hair and move the two parts forward across your shoulders just like in the previous method. 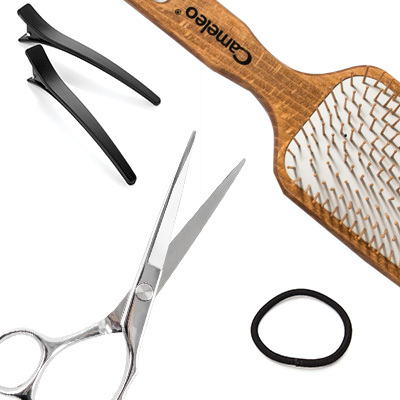 Twist one part of your hair, hold firmly and cut the desired amount of hair. Do the same with the other part of hair. The last method is a bit more advanced, but certainly rewarding; it will result in a beautiful layered cut. Bend forward with your hair let down and comb it thoroughly. You might use the hair spray to stiffen the hair and enhance the more precise cut. Still bending forward, comb your hair into a ponytail and secure it with an elastic just above the top of your head. Pull off the elastic towards the ends and cut the hair just below it. Release your hair and shake it. That’s it! You have beautifully layered hair. After cutting, hair needs a proper care. 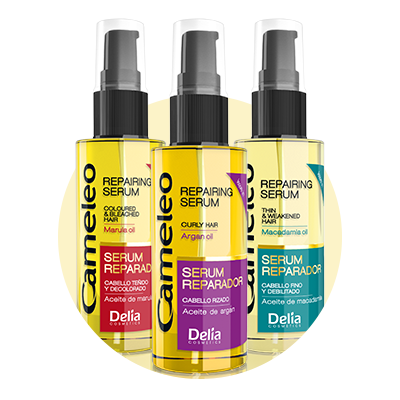 Rub a few drops of serum into your hair to create a protective layer which will make it look healthy and nourished. All described methods are easy enough to deal with dry and split ends on regular basis and improve the condition of your hair month by month!